The underwater 3D reconstruction has been a popular topic in computer vision research community for the last decade and it still remains a challenging problem. The Computing Science laboratory at the University of Alberta (Dr. Herb Yang’s Lab) has been a long-time partner of Ocean Networks Canada in improving the 3D camera technology in the ocean. The first 3D camera array (dubbed Grasshopper) was deployed at the Folger site of the NEPTUNE Observatory in 2011. A collaboration between laboratories of Drs. Sally Leys (Biology, University of Alberta) and Herb Yang (Computing Science, University of Alberta) the 3D camera inspired a number research projects. Visit Dr. Ley's Lab to learn about some of them. 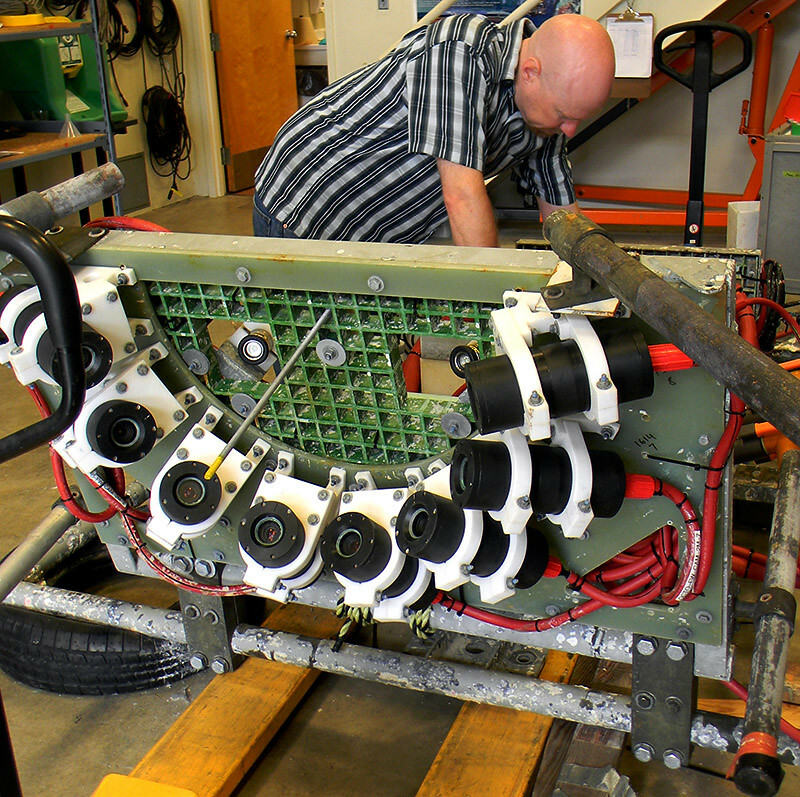 Marine equipment technologist Jonathon Miller (ONC) works behind the 3D "Grasshopper" camera array, part of Folger Pinnacle instrument platform, prior to installation in August 2012. In September 2014, a new 3D camera system was deployed in Saanich Inlet. It includes 8 cameras and 3 projectors arranged in a circle, all of them oriented to focus on a common viewpoint. Equipped with 5M pixel lenses, the system will be observing the underwater habitat and reef ball structure for the next 6 months. 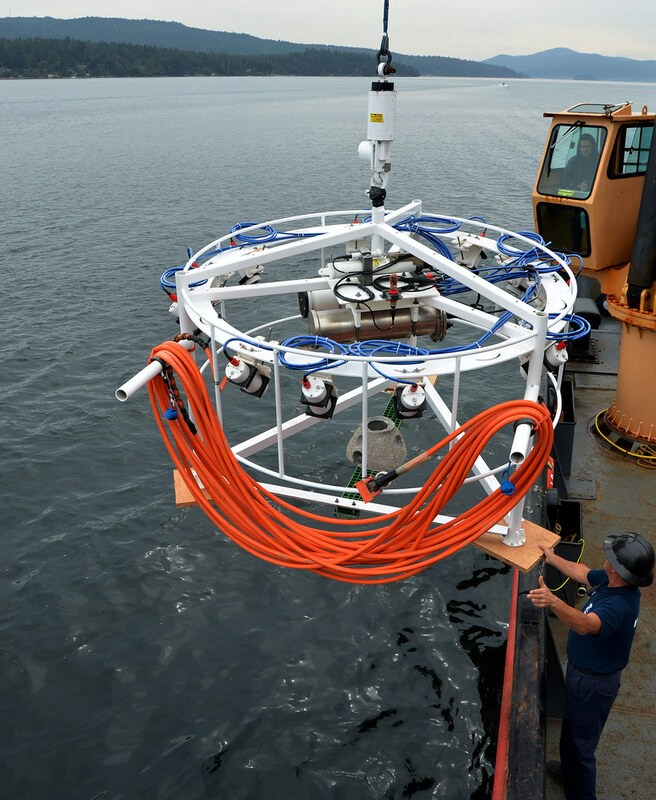 An experimental 3D camera system, complete with reef ball in the middle, is deployed to the seafloor in Saanich Inlet, 17 September 2014. One significant difference from the previous design is that the new system offers very accurate 3D information of the underwater habitat. With the new camera-projector configuration, it can reconstruct the 3D model of the habitat with the error in millimeter-level. Some existing underwater camera systems provides images of the habitat where the information is 2D only, while others that provide 3D information are not as accurate as the one we have developed. The main challenge is the system calibration, where we need to obtain accurate parameters to accommodate for the water and glass refraction so that the error in the 3D model can be minimized. The test deployment in Saanich Inlet for the first 6 months is a proof of concept. We want to make sure that the system can run flawlessly and with high reliability. Once we ensure the system is running consistently, we will focus on further improvements. For example, there are currently 12 slots on the supporting frame, where 8 of them are occupied by the cameras and 3 by projectors, so there is one slot reserved for a camera or projector extension in the future. Another possible extension is to attach a structure similar to the reef ball and help collect research data. Stay tuned for updates.